Borley Rectory was once called the “Most Haunted House in England.” It was the subject of a best-selling book and became a media sensation in the 1930s. 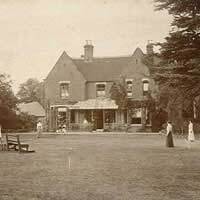 Borley Rectory in Eastern Essex was constructed in 1863 by the Reverend Henry Bull. By all accounts, it was not an attractive building, but it was large, with 23 rooms spread over two floors and a spacious attic and cellar. Almost from the time when the Reverend Bull and his family first moved in, the house appears to have been haunted. The ghost seen most often by the family was that of a nun, though a ghostly horse-drawn carriage was also witnessed from time to time. Exactly who the nun might have been was not known, but local stories circulated of a nun who had attempted to elope with a monk in the Middle Ages. In one account, both were caught, the monk hanged, and the nun buried alive; in another, the monk strangled the nun after the two had a falling out. Henry Bull died in 1892 and his son Harry succeeded him as rector. The haunting continued as before. By now, the building’s spooky reputation had spread throughout the community and, when Harry Bull died in 1927, finding a replacement rector proved to be quite difficult. In fact, the rectory was to remain unoccupied for a whole year until the Reverend Guy Eric Smith and his wife moved in. Having previously been sceptical of the paranormal, the Reverend Smith promptly changed his mind after experiencing some of the unusual phenomena. In addition to the nun, the ghost of Harry Bull was now spotted too. Strange voices were heard and a mysterious light would occasionally glimmer in some of the windows. Bemused by all this, Reverend Smith contacted the Daily Mirror which, in turn, contacted Harry Price, founder of the National Laboratory for Psychical Research. Price arrived and carried out a comprehensive investigation of the house, interviewing many witnesses and compiling extensive notes on all of the unusual phenomena. When the Smith family moved out in 1930, the Foyster family moved in. It was during the 5-year tenancy of the Foyster family that the incidence of spooky activity was to reach its peak. Many bizarre events took place. Sounds and even voices were heard coming from unoccupied parts of the house. Mysterious writing was found scrawled on the walls and on pieces of paper which appeared from nowhere. Objects and people were thrown around by forces unknown. When the Foyster family moved out in 1935, Harry Price was able to lease the building for a whole year so that he could pursue his paranormal investigations systematically. He advertised in the newspapers for volunteer researchers who would live with him in the building, conducting vigils and noting down anything unusual. Harry Price was, in many ways, the first modern ghost hunter. Although the ghost hunters of today tend to deprecate his lack of precision, he was, in fact, far ahead of his time in the use of sophisticated equipment to conduct investigations. In Borley Rectory, he made use of cameras, including a motion picture camera, and even portable telephones to allow the researchers to communicate with one another while in different parts of the sprawling building. Not much in the way of the paranormal was witnessed during Price’s one-year tenure of the house. The nun made no appearances. One of the researchers did hold a séance, however, in which she claimed to have been contacted by the spirit of the dead nun. Her name was Marie Lairre. She had come from France to live at the convent in Borley, but ended up being murdered by the local lord. In 1938 the Rectory was purchased by Captain William Gregson. He lived in the property for only a short time before it burned down in 1939. While digging in the fire-scarred ruins in 1943, Harry Price came across some buried bones which he claimed were those of the murdered nun. He arranged for a proper burial to take place. In 1939, Price wrote a popular book about the rectory, titled The Most Haunted House in England, and followed up with another, The End of Borley Rectory, in 1946. After Price died in 1948, some people critiqued the whole Borley Rectory phenomenon, calling it a fraud. They claimed that Harry Price had essentially invented the haunting on his own, because he desperately wanted to investigate a haunted house and to write books about it. One reporter, who attended a vigil with Price during which he found himself being struck by stones, suspected that Price was the culprit, confronted him and claimed to have found a number of stones in Price’s coat pocket! There were many independent witnesses to paranormal phenomena at Borley Rectory, however, so, even if he is accused of sensationalising the haunting, it is hard to credit that Price invented it out of whole cloth. Following its destruction by fire, the building was demolished in 1944 and a number of private residences now stand in the same spot. Though the residents are said to be averse to publicity, quite a few have reported ghostly and unexplained phenomena over the years.